The 33 metre motor yacht Musbe Dreamin, listed for sale by Marcos Morjain at Reel Deal Yachts, has been sold with Clifford Allenby at Allenby & Associates introducing the buyer. Built in GRP by US yard Westship to a design by Jack Sarin, Musbe Dreamin was delivered in 1998 and had a new exterior paint job in 2010. Accommodation is for 10 guests in five cabins consisting of a full beam master suite, VIP suite and three twins, all with television sets and en suite shower facilities. The main saloon is ideal for relaxation, with comfortable sofas, four barrel chairs, a granite-topped bar and an entertainment system with a formal dining area forward for eight guests. Outdoor dining is available on the aft deck which comes with built in seating, a table and three occasional chairs to host 10 guests. Air conditioning flows from an overhead soffit so as not to create cold spots and also to reduce noise. Up on the flybridge, more al fresco entertainment and dining is offered as it hosts a helm station, full wet bar with four stools and a Jacuzzi tub that converts to a sun pad plus a stereo sound system. In addition, the custom hard top was replaced in 2012. Forward to port is an entrance to the raised pilot house with an L-shaped settee and large table. Twin 1,525hp MTU engines give her a cruising speed of 20 knots and a maximum speed of 24 knots. 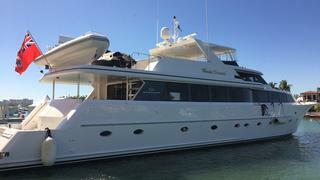 Lying in Fort Lauderdale, Florida, Musbe Dreamin was asking $2,385,000.